The parade drew thousands of fans from across the region. PHILADELPHIA (WPVI) -- After days of anticipation and building excitement, the Villanova Championship Victory Parade went off without a hitch in Center City Philadelphia. The parade, which celebrated the Villanova Wildcats' historic NCAA Championship victory and drew thousands of fans from across the region, stepped off from 20th and Market streets in Center City at 1 p.m. Images from the Villanova Championship Victory Parade down Market Street to Dilworth Park in Center City Philadelphia. The men's basketball team and coaching staff, as well as Villanova University's cheerleaders and band, all took part. The procession also included the Cardinal O'Hara High School marching band, and members of the 1985 National Champion Wildcat team. The stars of the parade, though, were the 2016 champs, who rode atop a double-decker bus and took turns hoisting the NCAA trophy over their heads. VIDEO: Wildcats make their way down Market St. 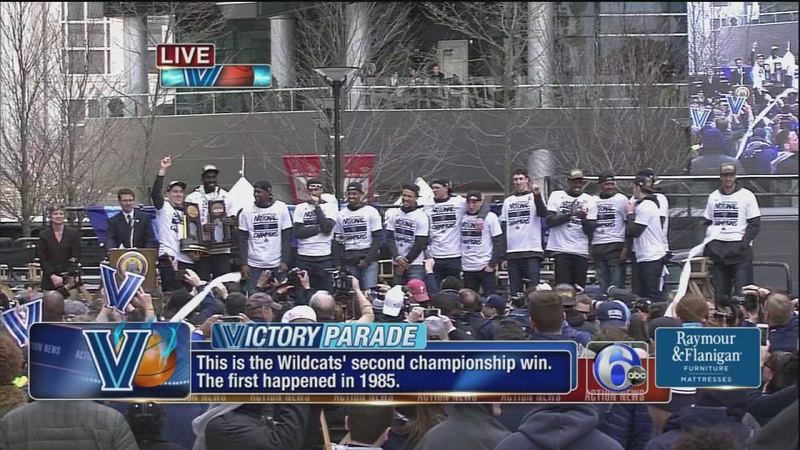 The Wildcats are making their way down Market Street and cheering along with fans in their Victory Parade. The parade headed east toward Philadelphia City Hall, where a huge crowd gathered for a victory rally at Dilworth Park. Large crowds began gathering Friday morning, and also along the Market Street parade route. Fans of all ages have arrived along the parade route to cheer on the Villanova Wildcats, including students from Ryan Arcidiacono's alma mater, Neshaminy High School. Those crowds included fans of all ages, and from all walks of life. They also included the parents of the championship game's MVP, Ryan Arcidiacono. 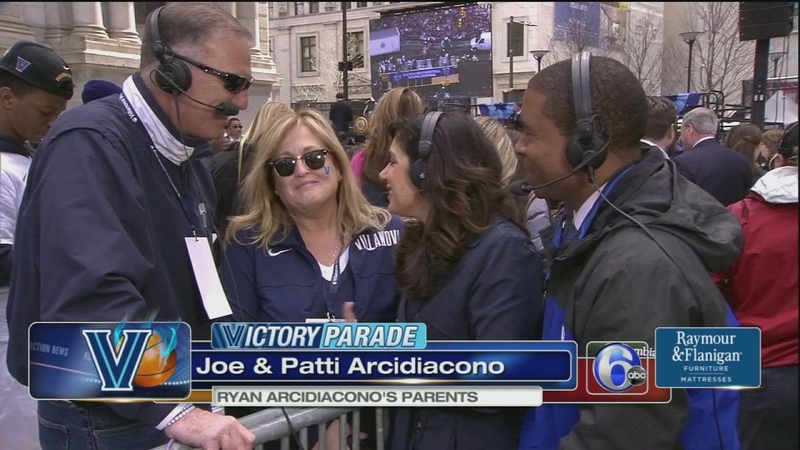 Joe and Patti Arcidiacono talked to Action News about how proud they are of their son and their Villanova roots. Ryan Arcidiacono's parents, Joe and Patti Arcidiacono, talk about how proud they are of their son and their Villanova roots. At the rally, the crowd heard from Philadelphia Mayor Jim Kenney, Pennsylvania Lt. Gov. Mike Stack, who is Villanova alumnus, and Villanova's president, Father Peter Donohue. 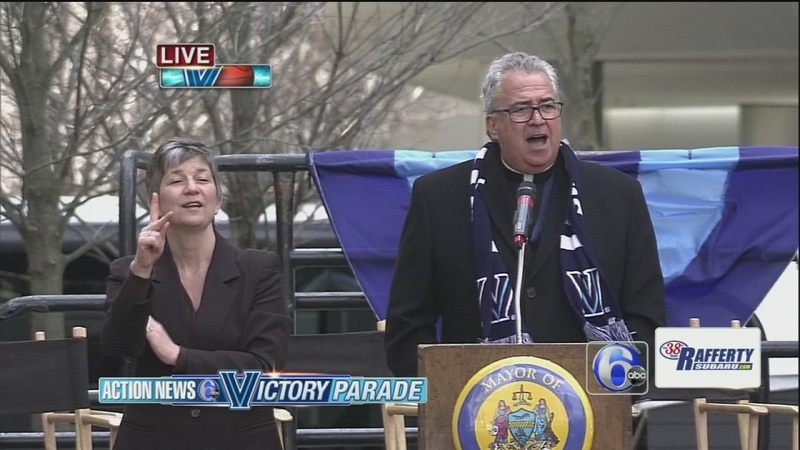 Villanova President Father Peter Donohue thanks fans, alumni and all of Nova Nation for their continued support. Then the 2016 team arrived, each introduced individually by Assistant Head Coach Baker Dunleavy. Introducing the 2016 National Champion Villanova Wildcats! And those in attendance got a chance to hear from Wright, who led the crowd in a rousing response chant of "Nova... Nation!" then thanked the players, their parents and their fans for an historic season. 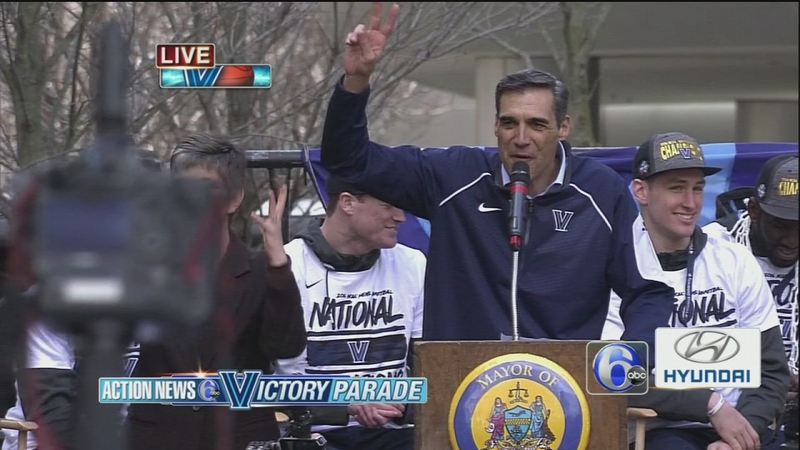 Villanova Coach Jay Wright leads the entire city of Philadelphia in a Nova Nation chant. Wright then introduced several players, including Arcidiacono, Daniel Ochefu and Kris Jenkins, who addressed the crowd of thousands. The rally concluded with a video showing the dramatic, buzzer-beating winning basket from Monday's championship game against North Carolina - and a loud cheer, accompanied by streamers and confetti, from the crowd. 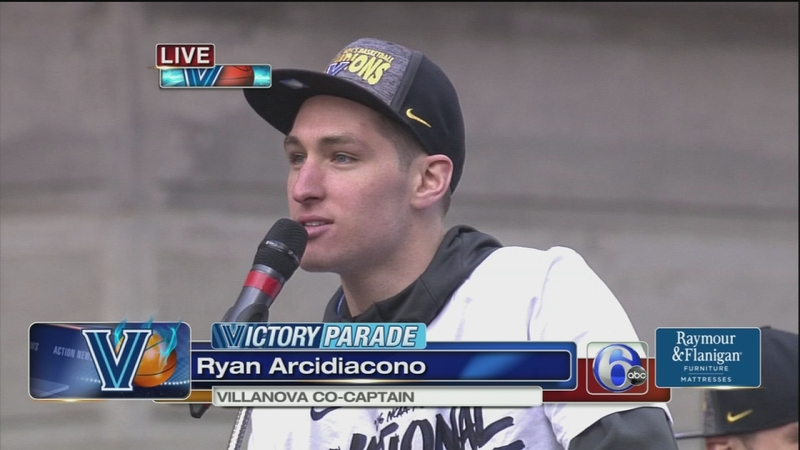 Co-Captain Ryan Arcidiacono thanks Nova Nation at the Villanova Victory Parade. 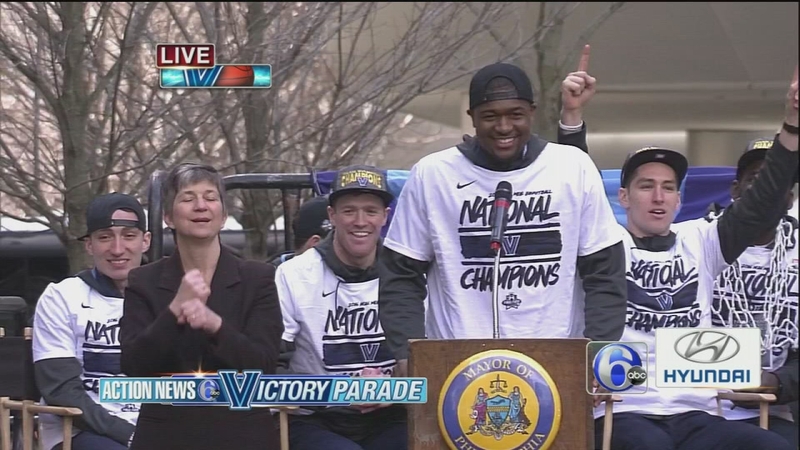 Forward Kris Jenkins speaks at the Villanova Victory Parade following his buzzer-beatnig shot in the NCAA Championship. 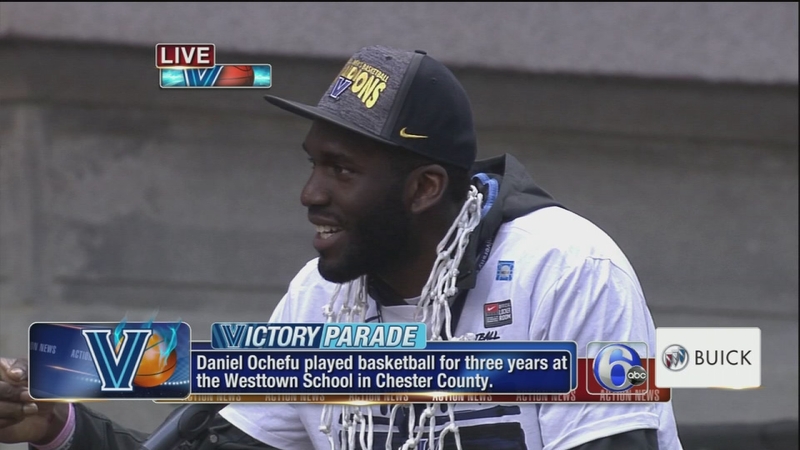 Co-captain Daniel Ochefu speaks at the Villanova Victory Parade.